Hi there! Have you ever wondered effective your catalogue price rules, coupons and other promotions really are? Are you worried that you sometimes discount too much, or too little? In this blog post we’ll discuss some metrics you can use to see which promotions that really are working, and how you can use that information to craft promotions that grow your business. To our help we have a huge promotion analysis of three retail categories. Happy reading! Our data suggests that promotions typically account for 10 to 45 percent of a retailer’s total revenues. And for sure, promotions are a powerful instrument for increasing sales and margins, but they are also difficult to use effectively. One reason for this is a lack of clear insight into which promotions are working—and why. Available research indicates that 20 to 50 percent of all promotions generate no noticeable lift in sales—or, worse, have a negative impact. Another 20 to 30 percent dilute margins in that they don’t generate an increase in sales sufficient to offset promotion costs. A rather gloomy picture. A promotion for a brand will in most cases result in a temporary sales lift. Persistent long-term sales lifts are rare. For consumer-packaged goods, a 10% price reduction will on average lead to a 36% increase in short term brand sales. However, a promotion will also impact sales of other non-promoted brands in the same category. 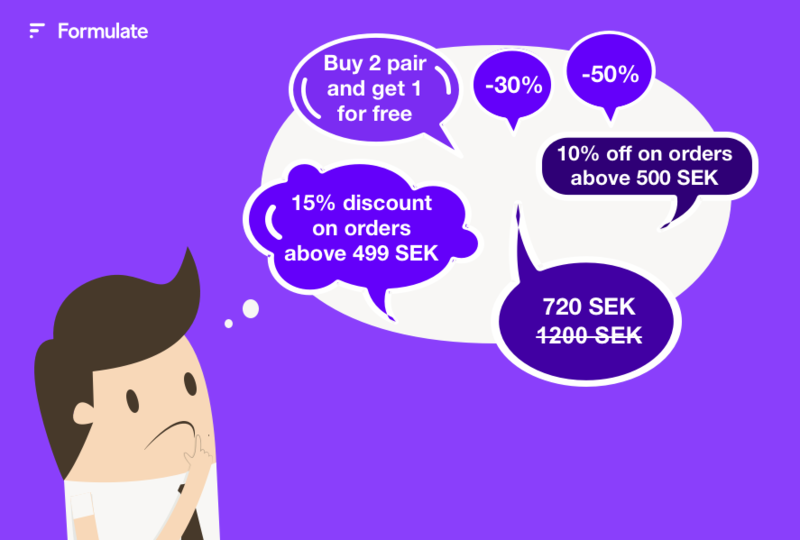 We call this effect switching since the promotion makes customers switch between brands in the category. A positive switching implies that the promotion makes customers buy more of other complementary products. Imagine for example that you make a price promotion for minced meet and as a result you sell more tortillas. 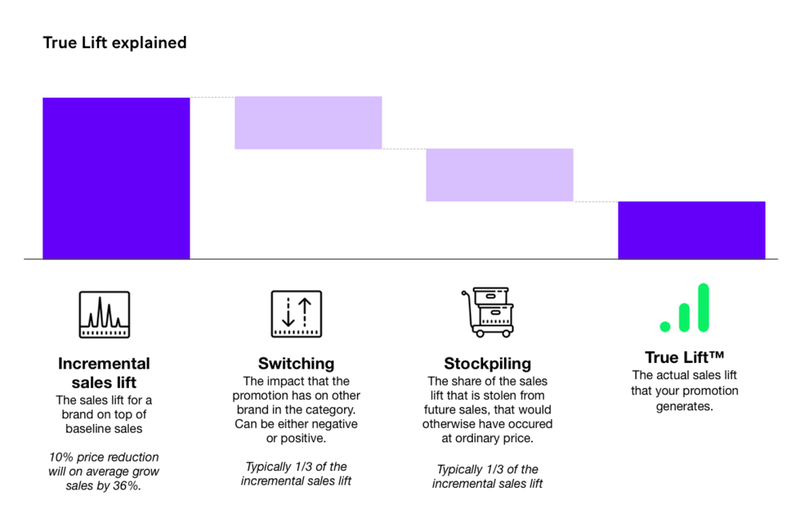 Negative switching implies that the promotion makes customers buy less of other brands in the category. For example, that you sell less Adidas shoes if you promote Nike shoes. Finally, we also have to account for the promotion’s impact on future sales. Typically, a promotion will make customers stockpile storable products. A high stockpiling implies that customers buy more of the product when prices are low. and less, than what they would otherwise have bought, when prices were regular. On average about 1/3 of the promotion sales lift will be due to consumers buying larger quantities and making more frequent purchases, 1/3 of the sales lift will be due to switching and another 1/3 due to stockpiling. These effects however differ significantly between categories and brands. promote and how much to lower the price? Now, wouldn't it be nice if there was a metric that captures the... true lift from a promotion!? A one metric that accounts for all these complex effects and shows you how your promotions work? Well, there is, and it's called True Lift. The True Lift is one of our best tools when it comes to finding effective promotions. It tells us which products that respond well to a promotion related price reduction, and how much sales lift you can expect from a promotion price change when we have adjusted for baseline sales, switching and cannibalization. We recommend retailers to prioritize categories and brands with high a True Lift. And that the True Lift is also used when adjusting the depth of a price promotion so that the promotion contributes to the business goals (sales and/or profit). Below is a really interesting study of the True Lift from price promotions in three FMCG categories – Yogurt, Canned Tuna and Sugar (Heerde et al. 2003). The analysis is based on nearly 64,000 store visits. In this analysis stockpiling effects have been included in the incremental sales lift. The table below describes what will happen with sales quantities if a 10% price promotion was introduced. In line with general findings, brand switching accounts for about 1/3 of the incremental sales lifts. It is also interesting to notice that there are significant differences in the True Sales Lift between brands, with effects ranging from 17% to 29%. Another key finding is that a high incremental sales lift (e.g. Sugar Brand A) does not necessarily translate into a high True Sales Lift (Tuna Brand A). Numbers have been rounded off.